This morning in Potiskum, Yobe State, a suicide bomber killed at least 50 secondary school students during their school assembly. There was no word from the Presidency until a few moments ago, when the President’s Special Adviser on Media and Publicity, Dr. Reuben Abati, released a statement on his blog, here. What followed the publication of the statement on Potiskum was that people who had been itching for the President to speak on the matter, got a little irritated. It also did not help that splashed across the top of the statement from Dr. Reuben Abati, was an image from Boko Haram’s propaganda album. Dear Nigerians, it is with a very heavy heart that the President conveys his deepest sympathies at the horror that that took place in Potiskum this morning. President Jonathan, a parent himself, shares in the grief and sorrow of the Government and people of Yobe State, the parents of our children cut down in their prime and, indeed, all well-meaning Nigerians in our joint loss. No parent should ever have to bury their child, and the circumstances of the senseless brutality, an apparent suicide bombing, make the situation even more reprehensible. The President condemns the dastardly murder of the students on their school’s assembly ground as they prepared to begin another week of study in pursuit of a better life for themselves and their families. He assures the grieving parents and people of Yobe state that no matter how long it takes, the Federal Government will ensure that all those responsible for the senseless murder of so many promising youngsters and the continuing acts of terrorism across the country are brought to justice and made to pay for their atrocious crimes. Thank you for this piece, a poignant reminder of the shocking lack of empathy of Goodluck Jonathan’s government. The formulaic, reactionary manner in which this government has handled all aspects of the Boko Haram insurgency – from information management to prosecuting the war itself – only shows one thing – they really do not give a damn. To your little prayer at the end – Amen. “Perhaps the Presidency is also a little numb? ” Good question. Violence upon violence can make people numb, especially when the acts are taking place “far away”. I’m glad that even if the presidency does not show greater sensitivity, the people remain concerned and vocal. Btw, are you looking for Abati’s job? 😉 Kill me later! 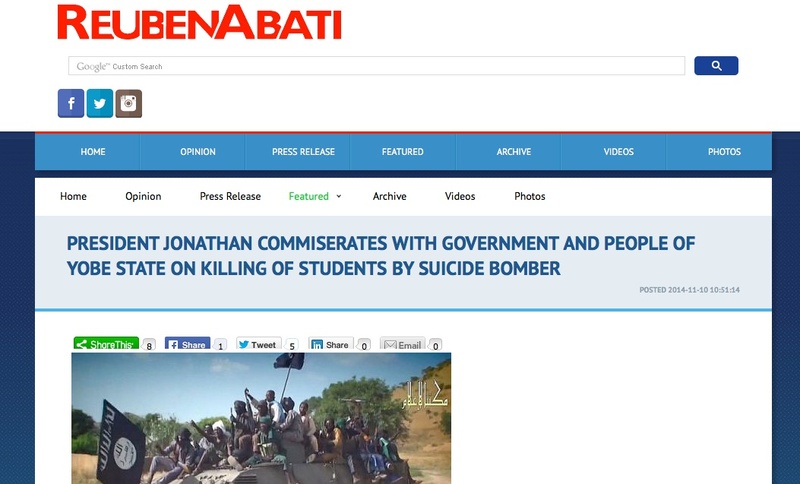 The sheer incompetence of Reuben Abati shocks me. considering the fact that he used to be a journalist. I guess money and position really does numb people. Actually, everyone has gone numb. We have endured too much pain and we can barely react anymore.